You've got a never-give-up attitude. No matter the conditions, you're going to stand tall and meet all your obstacles toe-to-toe. You need men's hikers to match your sheer willpower. men's KEEN Utility 1012771 Braddock waterproof steel toe hikers are for men with t ... (see full details) (see specifications) #KEN1012771. You've got a never-give-up attitude. No matter the conditions, you're going to stand tall and meet all your obstacles toe-to-toe. You need men's hikers to match your sheer willpower. men's KEEN Utility 1012771 Braddock waterproof steel toe hikers are for men with the never-give-up attitude of a spawning salmon. Whereas spawning salmon live in rivers and breathe water, you're a working man who doesn't want soggy feet. 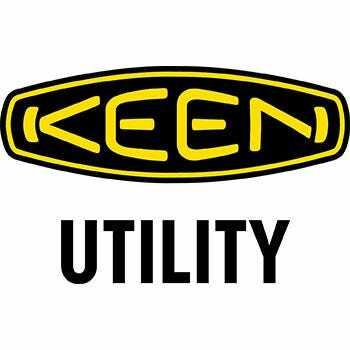 That's why KEEN Utility has included their proprietary KEEN.Dry technology in these brown hikers. This waterproof lining works in conjunction with the waterproof leather uppers to ensure your feet stay warm and dry whether you're working in a downpour or skipping stones at the creek. The lining is a waterproof, breathable membrane that lets moisture out, but never lets water into the KEEN Utility hikers. Technically, it's called a hydrophobic/hydrophilic 2-zone comfort technology. That's a long-winded way of saying "your feet stay dry." And if conditions do get wet and sloppy, these steel toe hikers will keep you upright and focused on your job. That's because they come with oil- and slip-resistant non-marking rubber outsoles. These durable outsoles have such good grip that they meet or exceed ASTM F1677-96 Mark II non-slip testing standards. Add in TPU stability shanks, and you'll be as sure-footed as a mountain goat. To prevent aching feet, these waterproof hikers feature a proprietary direct-inject PU midsole construction, improving durability and longevity to midsoles that don't compact over time. The integrated PU heel cushions and removable dual-density EVA Metatomical footbeds cushion and cradle your feet. The anatomically engineered arch support follows the natural contours of your feet like the salmon follows the bend in the river. However, all this foot-pampering technology means that these safety toe hikers are not compatible with after-market insoles or orthotics. What work footwear be complete without toe protection? Not these American-built EH hikers. They feature left and right asymmetrical safety toes that meet ASTM F2412 and F2413 standards for impacts and compression. These contoured toe caps allow you more room and maximum comfort. These are also electrical hazard rated to prevent untimely shocks. As a final layer of protection, KEEN.Protect wrap the outsoles up and over the toes. It's like a rubber helmet for your toes. Spawning salmon, sure-footed mountain goat - no matter what animal analogy we use, this is some serious KEEN Utility footwear. If you want the best for your feet, you need a pair of KEEN Utility 1012771 Braddock steel toe hikers. I've been doing electrical work in Fl., both indoors and outdoors, for over 23 years. Have tried a lot of other brands with limited satisfaction. I've tried Wolverine, Redwing, Rocky and Irish Setter mid-range models. This is the first review I've ever written. That should tell you how much I appreciate these boots. I've had them for over 2 month now. Very comfortable out of the box. First day I was on my feet for a full 10 hour shift, with no break-in period and had no issues with foot rubs or arch fatigue. I usually require after market arch supports to deal with this. I needed steel toes and electrical protection. I like the waterproofing when I have to work during frequent and unexpected rain showers. The soles have deep tread and good grip on concrete. They do not squeak when I walk on concrete. I really like how easy and quick they are to put on and take off. The boot easily opens wide. The lower laces pull tight quickly and the top eyelets have a lace grabber feature. In other words, the laces keep the tightness in place until you tie them. Love this! Also, they do not loosen up during the day. Taking them off you only have to undo the top eyelet and the others loosen easily by pulling the tongue open. The tongue also stays centered and doesn't slide down like others I've had. These do not require polishing to keep them looking presentable like most leather ones. Just buff them with the boot brush as needed. Also, having the rubber come over the toe prevents me from scuffing them when I inadvertently kick against things. The insole is contoured to fit my feet well. I don't have to spend an additional $20-70 for separate after market supports! I did my research by reading reviews from other sites. As recommended by many, I ordered these Keen's 1/2 size bigger than other brands. Turned out to be the right decision. No rubbing on the steel toe cap, yet the heel area is supportive for me. The EE size provided a comfortable fit in the toe box. All of the eyelets are metal except the center ones that you use to tighten the tongue area. Appears to be a great design that should provide longevity. Yes. I am recommending these to my coworkers. I am very happy with the boots. KEEN Utility 1012771 Men's Braddock Steel Toe Hikers is being added to your cart.